Emily Morrison as Dr. Vivian Bearing. Photo credit: Harvey Levine. CANCER… Did you cringe when you saw the word? Did you hold your breath slightly or consider reading something else for a minute? You know, I’m not even sure if there’s a scarier word. The mere utter of the word or even the thought of the disease sends most people running in the opposite direction, for fear that it’ll jump out of the ethers of consciousness and on them. As a writer, I often try to find ways to make serious topics such as the big C more digestible for human consumption. How I offer up a topic is key because I know that some stories just won’t be heard if I don’t sprinkle bits of humor and wit on top just so that it can go down slightly easier. But in the thick of it all, where life is concerned, is wit really enough to see us through our loneliest hour? Grab some tissues but get a ticket. It’s definitely worth seeing. 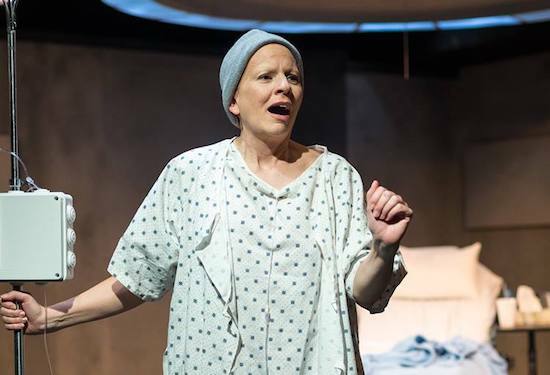 The play “Wit” is set in a hospital room. A lonely hospital room. No flowers, balloons or get well cards on a nightstand. No waiting visitor resting in a chair beside the bed. Just a dreadfully, colorless room with fluorescent lighting, a messy hospital bed, a bedpan, a serving tray, a nightstand, a monitor with green writing running across its screen, and an IV connected to the frail lifeless body of Dr. Vivian Bearing (Emily Morrison). Oh, and one more thing was present in the room. Her WIT. I wouldn’t call Dr. Vivian Bearing (Emily Morrison), lecturer and professor of the metaphysical poetry of John Donne, a genius. I wouldn’t even call her smart. Ph.D. and all, that seemed to be far from the case as I observed her. Although it seemed that this is what the writer and even director would have us believe. However, I’d describe her as relentlessly inquisitive and dependent on her own intelligence to get her through a time in life that requires little to no superior intelligence. While her wit seemed to carry her through, in quite an interestingly beautiful way, I couldn’t help but feel crushed and pity for her as her entire belief system unraveled. To watch this woman’s health humble her to an honest observation of herself made the tears roll across my cheeks and forced me to call my own life into question. This. Is. A. Sad. Play. There is no amount of sugary wit that can be sprinkled on top of this story that’ll be enough to mask the taste of Dr. Vivian Bearing’s sad ending. You will not leave feeling rejuvenated or dosed in some new found comfort around the meaning of life. Instead, you’ll be submerged with the most real display of cancer I’ve ever seen on stage. And you’ll possibly leave taking an honest look at where your priorities lie in this life and if you need to do some readjusting. In “Wit,” Dr. Vivian Bearing jumps in and out of her experience to tell us who she is and how life got her into that lonely hospital bed and undergoing the most invasive treatment recorded in history. Actor, Emily Morrison, does an excellent job with her subtle and honest interpretation of the character and her performance is effortlessly real. She does an excellent job carrying the show and her rhythm and display of wit kept us engaged. The direction of the play was well thought out. I thoroughly enjoyed the pace of the story and those simple choices made by director Jeff Mikoni, made the experience all the more real. From X-rays to Cat scans, she moved about the stage in a way that truly made me feel her discomfort and exhaustion. It was as though I could even see the machines that weren’t technically there. The invasive treatments on her body were brought about in a carelessly sterile manner. Hospitals just don’t seem like a place where healing happens in this play, and we can see why, as we meet the emotionally void Dr. Harvey Kelekian (Gary Sullivan) and his fellow the eccentric Dr. Jason Posner (Sebastian Leighton) a former student of Dr. Vivian Bearing. He is far more interested in conquering the disease than healing a human and his deliberate dissociation is somewhat scary to watch but still understood by Dr. Vivian Bearing who lived her life in a similar manner. While everyone constantly asks this dying woman, how she’s feeling today, no one seems to really genuinely care. Well, all except her nurse who reveals her compassion only when the topic of whether or not to resuscitate her arises. All this happens while Dr. Vivian Bearing and eventually the audience tries to find the meaning of John Donne poem, an old English poem that is mystical and quite frankly confusing. While this play is covered in some pretty hard topics, it is the most honest portrayal of disease, doubt and denial I’ve ever seen and it offers an honest voice to the experience of those who have suffered in such a way. Grab some tissues but get a ticket. It’s definitely worth seeing. “Wit” runs weekends through February 3, 2018. For tickets, click here. Alisa is an author and playwright. Her works have been performed at theaters, national facilities and organizations like the La MaMa Experimental Theatre in New York, NY, The Civil War Museum in Washington, DC, The Eubie Blake National Jazz Institute and Cultural Center in Baltimore, MD, and many others. She is also the owner of the Drama MaMa Bookshop, as well as, the Artistic Director of A Work in Progress Theatre Company.